AFC Rushden & Diamonds boss Andy Peaks has paid tribute to fans’ favourite Matt Gearing after he left the club this week..
Because of work commitments, Gearing has left the Dog & Duck and joined Yaxley, who last week appointed ex-Northampton and Peterborough striker Ian Benjamin as their manager. Gearing was a key figure as Diamonds won the ChromaSport & Trophies United Counties League Premier Division title last season. But because he lives in Huntingdon and works in Norwich, he’s decided to make the switch to a club closer to home. Gearing’s total of 115 appearances for the club is bettered only by Sam Brown (126) . He helped Diamonds win two promotions in three seasons and Diamonds manager Peaks said: “Matt has left on good terms and the door is still open for him here. “If circumstances change, he’s welcome to come back. “You never know what will happen. We might see him in a Diamonds shirt again. Peaks looks set to move quickly to replace Gearing. Peaks revealed he has been approached by several players since the end of the season, but as it stands, Ollie Wilkinson, Dan Quigley and Dom Lawless are currently the only new arrivals while Courtney Herbert and Jason Kilbride will be on trial with the club. 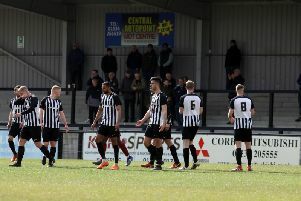 They will train with the squad next week as Peaks starts his preparations for the for the forthcoming Evo-Stik Southern League Division One Central season, which kicks off on Saturday, August 8. Peaks said: “I’m more than happy with what we’ve got. “I’ve had a few calls from players who want to come and have a look at us, but I don’t want to flood it and maybe upset some of the players we have who deserve their chance at the next level. “I told the players that won the title for us last season that they would get their chance and that still stands. Club members have now voted to confirm Diamonds’ matchday admission and season ticket prices for the new season. Season tickets are priced at £149 for adults, £94 for concessions, free for under-16 members and free for under-8s. Matchday prices, 2015-16: adults £8, concessions £5, under-16 members free, under-8s free.